Buying a home is, for most of us, the most substantial single investment we’ll ever make and all of us want to make sure we do it right! Indeed, for many people the purchase of a home is "the American Dream”. There are few things in life more important than buying and protecting your home. Most homeowners provide for the security and safekeeping of their homes by purchasing homeowners insurance – to protect against future hazards such as fire, theft and weather damage. However, there is another insurance purchase that offers crucial protection to home ownership as well - title insurance. Title insurance is designed to make sure you are the legal owner, and no one has liens, claims, easements or restrictions on the property – other than the mortgage you agreed to pay and those encumbrances disclosed to you prior to closing. One of the steps in purchasing your new home is to select a title company to perform a title search on the property to determine the status of the title to the real property and offer title insurance to protect you against future challenges to the title. The Minnesota Land Title Insurance Association has designed this consumer guide in a "Frequently Asked Questions” format, as a tool for consumers to better understand how title insurance protects the purchase of real estate. "Title” is a collective term used to describe your legal rights to own, possess, use, control or sell your home/real estate. This includes all previous transfers of ownership and liens on the property as well as mineral rights, easement rights, and restrictions against its use. The title may involve unacceptable defects, claims or encumbrances which will typically require resolution prior to or at closing. Transferring title to real property (land – generally including any buildings or other improvements built on the land) is more complex than transferring title to a car or other personal property. While the land is permanent, land usage may change over time. For example, one may convey ownership of a piece of real property while retaining certain rights in the property such as mineral rights. What is a Title Defect or Encumbrance? What is a Title Search and Examination? What are the Different Types of Title Insurance? I am Purchasing a Newly-Built Home. Do I Really Need Title Insurance? I am Buying Property from Someone I Know. Is Title Insurance Still Necessary? I am Refinancing My Home. Why Does the Lender Require a New Title Policy? What Does a Title Insurance Policy Cover? What Doesn’t a Title Insurance Policy Cover? How are Title Insurance Premiums Paid? Where Can I Purchase Title Insurance? What Should I Do if I Have a Claim? A title defect might include unpaid taxes, liens, an easement or restriction, an error in the public records, a missing or undisclosed heir of a previous owner, mental incompetence, fraud or forgery. The Commitment for Title Insurance issued after the search of the title and prior to the closing, discloses the results of the title company’s examination of the legal rights in the specific real estate. This is the basis for the buyer, seller & lender to determine which of the findings are acceptable (e.g., a utility easement) and which must be resolved at or prior to closing (e.g., a prior lien). Pay particular attention to Schedule B of the commitment, which lists any limitations, exceptions, special conditions, and requirements made by the title company. Title insurance is an indemnity contract in which the title insurance company, in exchange for a one-time premium collected at closing, protects against future losses resulting from defects in the title to real property that exist at the time of purchase but are unknown or undisclosed. Title insurance is significantly different from homeowners insurance and other property/casualty insurance. Casualty insurance provides protection from losses due to unknown future events, such as fire or theft for a specified period of time (one year of coverage for an annual premium). Title insurance on the other hand, provides protection for an indefinite period of time from future financial losses because of events that have already occurred (prior to the date of the policy), for only a one-time premium payment. Because of this title insurers and their agents work to eliminate many risks and prevent losses in advance through extensive searches of the public records and a thorough examination of the title. Title insurance is a contractual obligation between you (and/or your lender) and the title insurance company, wherein the title insurer, in exchange for payment of the premium, provides protection, effective as of the date of the policy issued, against future losses that might result from a variety of possible title defects or encumbrances. Title insurance provides protection against certain undisclosed defects or "hidden” risks as well. Because title insurance covers losses due to defects that already exist, a major part of the title insurance transaction is the title search and examination. Before issuing a policy, the insurer or their agent will conduct a detailed search and examination of the historical, public records concerning the property. These records include, but are not limited to, deeds, mortgages, wills, court judgments, tax records and maps. The title search and examination may uncover potential defects and encumbrances, including liens, judgments and other restrictions. According to the American Land Title Association, 36 percent of title searches find a problem which the title insurer or their agent works with the parties to cure before closing and issuing the policy. There are two types of title insurance policies: a lender’s policy and an owner’s policy. The lender will require a lender’s policy typically in an amount equal to the mortgage loan. It covers the lender’s interest in the property for the life of the loan. The lender’s policy protects only the lender and does not protect you. The buyer may purchase an owner’s policy to provide homeowner protection for the full property value. It protects the buyer from covered losses arising from defects in the title that existed at the time of the purchase. It covers the buyer’s ownership interest in the property for as long as the buyer or his or her heirs have an interest in the property or are liable under the "warranties” of title they may have given when the property was sold. Should someone challenge your title (your legal rights of ownership) based on an insured risk, the title insurer must defend that challenge and pay all associated costs and any financial loss that might result. Title policies are written on standardized forms which are approved by the American Land Title Association. However, they are available at different costs and with certain different coverages allowed, so be certain to compare the same policy form and premium cost. 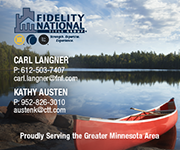 The payment of title insurance premium is a negotiable item between the buyer and the seller in Minnesota. However, generally it is paid by the buyer. If you are borrowing money pledging real property as collateral for the loan, most lenders will require a loan policy to protect their interest in the property. You are not required to purchase an owner’s policy, but you should carefully weigh the potential impact of a loss against the cost of the title insurance. Neither the lender’s policy nor the policy of a previous owner will protect you if there is a claim. Also, remember there is generally a substantial discount offered when a lender’s policy and an owner’s policy are purchased at the same time. built home, there is a significant risk to the buyer that mechanic’s liens are or may be recorded against the title by unpaid suppliers, contractors and/or subcontractors who have worked on the construction of the home. Title insurance can often provide protection against the potential mechanic’s lien risk to a new owner. I am Purchasing a Newly-Built Home. Do I Really Need Title Insurance? I am Buying Property from Someone I Know. Is Title Insurance Still Necessary? Even though you know the seller well, there have been many previous owners/transferors of the land that you don’t know. A thorough search and examination of the title is necessary to disclose all existing liens and encumbrances. This disclosure allows you to choose which encumbrances are acceptable and which must be resolved prior to your purchase of the property. Remember, the seller’s title insurance policy would not protect you as a buyer against any defect or encumbrance. Only the purchase of a new owner’s policy will protect your ownership rights. Discounted title insurance premium rates may be available to you as a purchaser when a prior owner has an existing title insurance policy. Lenders require a new policy based on the new transaction amount to protect their investment in the property because defects or encumbrances in title might have arisen between the date of your original purchase and the date of the refinance transaction. For example, a building contractor may have put a mechanic’s lien on the property, or there may now be unpaid taxes, a child support lien or homeowner’s association lien against the title. The requirement for a new policy allows the new lender the opportunity to require that any such items be resolved prior to the funding of your refinance loan. ask your lender and/or title insurer or their agent about these discounts. Ask your title insurer or their agent to explain what is and is not covered under your title insurance policy. The title insurance premium is collected only once, at the time of closing. It is based upon the type of policy(ies) and amount of insurance you purchase. Title insurers are required to file their schedule of rates, including any discounts, which are approved by the Minnesota Department of Commerce. settlement service/closing related charges; so shop and compare – The choice is yours! Also, ask your friends, relatives, attorney or business associates about their experience and satisfaction with a title company in the past. First-hand knowledge is often your best guide. As soon as you discover a title-related problem, contact the insurer listed on the policy itself. Make your claim in writing and include a copy of the policy and copies of all relevant documents including any correspondence related to the claim. It’s always a good idea to keep copies of your claim submission for your own records as well. The title insurer should promptly acknowledge receipt of your claim and will accept or deny your claim in a reasonable amount of time. Prior to signing your purchase agreement, negotiate with the seller regarding the payment of the title insurance premium, the title related charges and any settlement/closing related charges. Check with your title company to see if you qualify for any discounts on the title insurance policy or policies you are purchasing. Verify that the title insurer and title agent are licensed to conduct business in Minnesota. Your real estate or mortgage broker might have an ownership interest in the title agency selected to close and insure the loan. This relationship must be disclosed. Ask about any and all relationships the broker(s) may have. Remember, you may choose any title insurer/title agent you desire. You cannot be required to use a specific title insurer or title agent suggested by a lender or real estate agent. Review the Commitment for Title Insurance and ask questions, if you do not understand its terms or the terms of the policy you are purchasing. Verify that your names are spelled correctly on the deed and mortgage documents at closing. Remember the difference in coverage between the owner’s policy and a lender’s policy. Seek legal advice, if you have any questions or concerns about the transaction. Where Can I Find More Information? Please visit the following websites. This Consumer’s Guide to Title Insurance is intended to assist consumers in understanding title insurance. It is not intended to replace the advice of an attorney nor is it an "all inclusive” informational source. Please refer to your title insurance policy for coverage details.